This is my dad’s favorite pie, maybe I should say one of my dad’s favorite pies. I think chocolate pie would rank high on the list also. 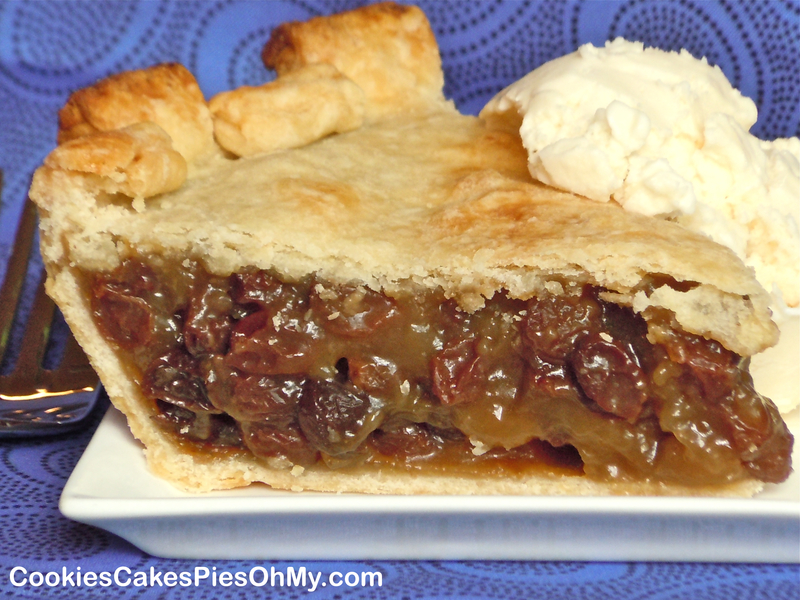 The filling for this pie is easy to make and has a rich caramel flavor and raisins, lots of raisins. Combine raisins and water in saucepan, bring to boil and cook for 5 minutes. Blend brown sugar, cornstarch, cinnamon, and salt together, slowly stir into hot raisins. Cook and stir until thick and syrup is clear. Remove from heat, and stir in lemon juice, butter, and vanilla. Cool slightly. Preheat oven to 425°. Line 9″ deep dish pie plate with bottom pastry. Pour raisin filling into pastry. Cover with top crust, seal, and cut a couple slits to vent. Bake 30-35 minutes, cover with foil if necessary during baking if crust gets too brown. Cool before serving. Serve with ice cream or whipped cream. Ooh, raisin pie! My mom used to make it when I was a kid! Sort of a lost favorite. Thanks for bringing it back. Making this for a older co-worker who’s mother made this for him many years back .he is always asking me if I can make it for him [ I love to bake] found your recipe so today am making him your pie for a SURPRISE !!!! Hope to bring a big smile to his heart when I give it to him !!! What a thoughtful gesture. Hope you have a wonderful surprise! Thanks for visiting my site! I just use regular raisins for my raisin pie…like Sun-Maid brand, or even a store brand. Hope that helps. Thanks for visiting my site. Happy Baking! I am 69 years old and I remember my Mom making raisin pie. It was a family favorite. I know it sounds morbid, but she use to call it “Funeral Pie.” When you attended a funeral in those days everybody brought pot luck and there was always a raisin pie served. Thanks for the memories. I also remember this pie being called Funeral Pie. I have a recipe and I tried it and it wasn’t the same as I remembered so your recipe looks so much better I will be trying this next. Thanks so much. Thanks for visiting my site Cindy. Hope this recipe is like what you remember! Thanks for sharing the real deal! A family favorite in our Canadian kitchens! Thanks Lynn. Happy Baking in Canada! After cooling, does this pit need to be refrigerated? The pie can stay at room temperature for a few hours, but I would definitely store it in the refrigerator to help it last longer.